A figurative portrayal of the rift within the Republican party resulting from the nomination of Abraham Lincoln for the presidency in 1860. 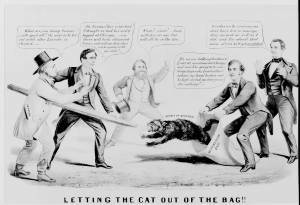 Here New York senator and would-be nominee William H. Seward watches as the radical antislavery senator from Massachusetts Charles Sumner releases a snarling cat, the "Spirit of Discord," from a "Republican Bag." The cat bolts toward New York "Tribune" editor Horace Greeley and Lincoln, who wields a rail in his defense. Greeley exclaims, "What are you doing Sumner! you'll spoil all! she aint to be let out until after Lincoln is elected,--" Lincoln, also alarmed, rejoins, "Oh Sumner! this is too bad!--I thought we had her safely bagged at Chicago [i.e., the Republican national convention at Chicago], now there will be the old scratch to pay, unless I can drive her back again with my rail!"